Thanks to Dr. Kseniya Korchagina, Chuvashia Republic Clinical Cancer Center, Cheboksary (Chuvash Republic, Russian Federation) for contributing this case, Dr. Ayana Suzuki, Kuma Hospital, Kobe City (Japan) for writing the discussion and Dr. Andrey Bychkov, Kameda Medical Center, Kamogawa City (Japan) for the Editorial Board review. To contribute a Case of the Week, first make sure that we are currently accepting cases, then follow the guidelines on our main Case of the Week page. (1) Please visit us in booth #1302 at the ASCP 2018 annual meeting in Baltimore. You can pick up color copies of our What's New Newsletters, sponsored by Emory University. Wednesday, October 3, 12:30-2 pm and 5:30-7 pm. Thursday, October 4, 9-9:45 am and 1-2 pm. 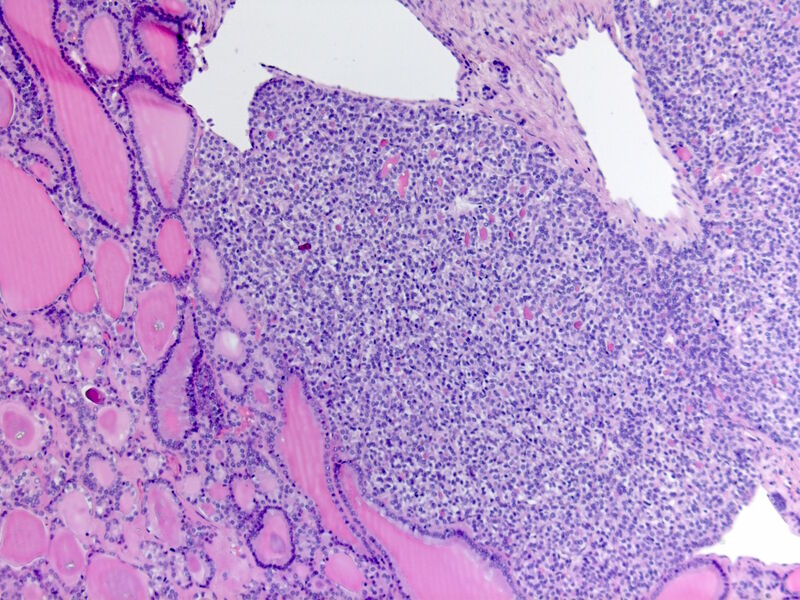 (2) We are in the process of changing the terminology of Wegener's granulomatosis on our website to granulomatosis with polyangiitis (Wegener's). The eponym was formally renamed in 2012 by the Chapel Hill Consensus criteria (see J Am Soc Nephrol 2011;22:587, Isr Med Assoc J 2007;9:207, Am J Gastroenterol 2018 Jul 16 [Epub ahead of print], J Clin Neurosci 2015;22:642). Friedrich Wegener had Nazi ties similar to Hans Reiter, which is why Reiter's disease was replaced years ago by reactive arthritis. (3) Please add CommentsPathout@gmail.com to your SafeList / Address book, so your subscriptions to our emails go directly into your inbox. If your email address has just changed, please let us know. You can change it yourself by clicking here and filling in the box at the bottom with your current email address, or you can send an email to NatPernick@gmail.com with the old and new email addresses. A 66 year old woman presented with a left ovarian mass, confirmed by ultrasound and CT scan of the abdomen and pelvis. CA125 was within normal limits. A total abdominal hysterectomy with bilateral salpingo-oopherectomy was performed, revealing an ovarian mass measuring 15 x 12 x 7 cm. Which antibody is most useful for diagnosing struma ovarii? 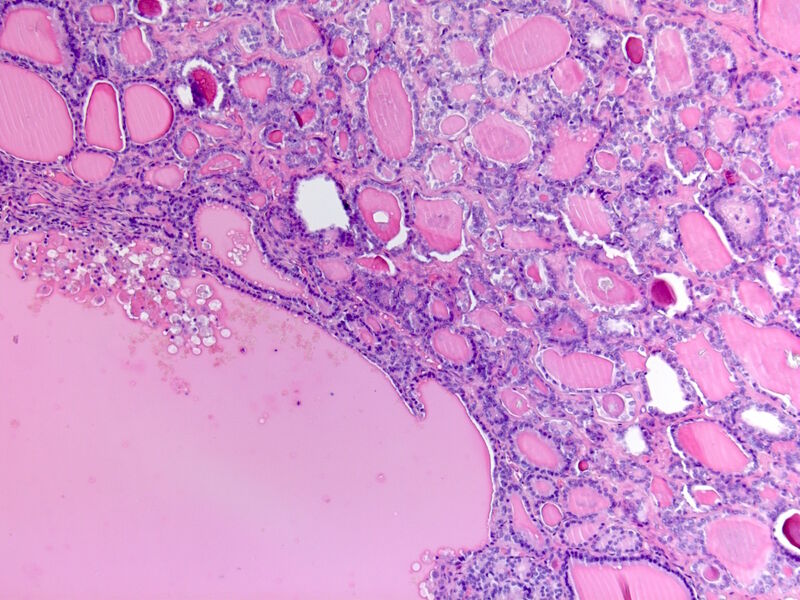 Struma ovarii is defined as a mature ovarian teratoma composed predominantly of thyroid tissue (Pathology 2007;39:139) which may harbor histological changes identical to thyroid adenoma or carcinoma (WHO Classification of Tumours of the Female Reproductive Organs, 4th edition, 2014). Struma ovarii accounts for 2.7% of all ovarian teratomas (Pan Afr Med J 2017;26:223). Most patients are of reproductive age (WHO Classification of Tumours of the Female Reproductive Organs, 4th edition, 2014) and have pelvic pain, abnormal uterine bleeding and abdominal or pelvic masses (Gynecol Oncol 2003;89:543, J Gynecol Oncol 2008;19:135). Up to one third have ascites. Patients rarely (7%) present with hyperthyroidism (Gynecol Oncol 2001;82:575). Struma ovarii is slightly more common on the left side (63%) (Gynecol Oncol 2003;89:543). 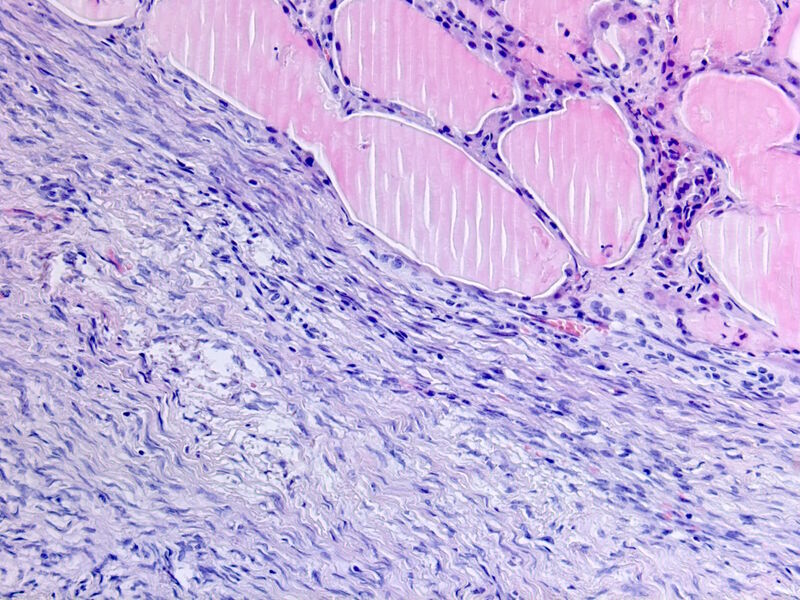 The tumor is unilateral and varies from 0.5 to 10 cm in diameter. It has a brown, solid and gelatinous surface on section and sometimes appears as a nodule within a dermoid cyst. Entirely cystic struma containing green gelatinous material also occurs (WHO Classification of Tumours of the Female Reproductive Organs, 4th edition, 2014). 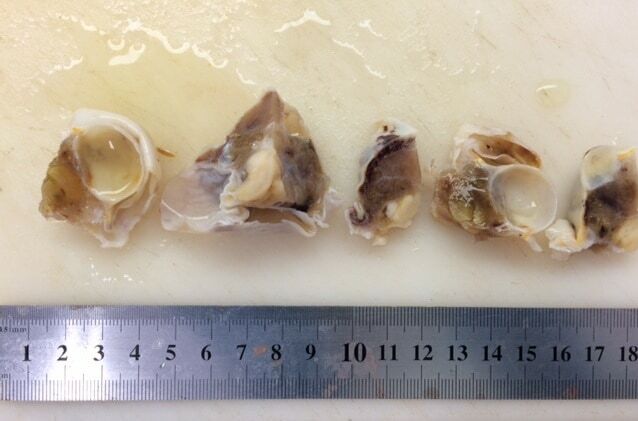 Malignant struma ovarii represent 0.01% of all ovarian tumors and 5 - 10% of all struma ovarii. 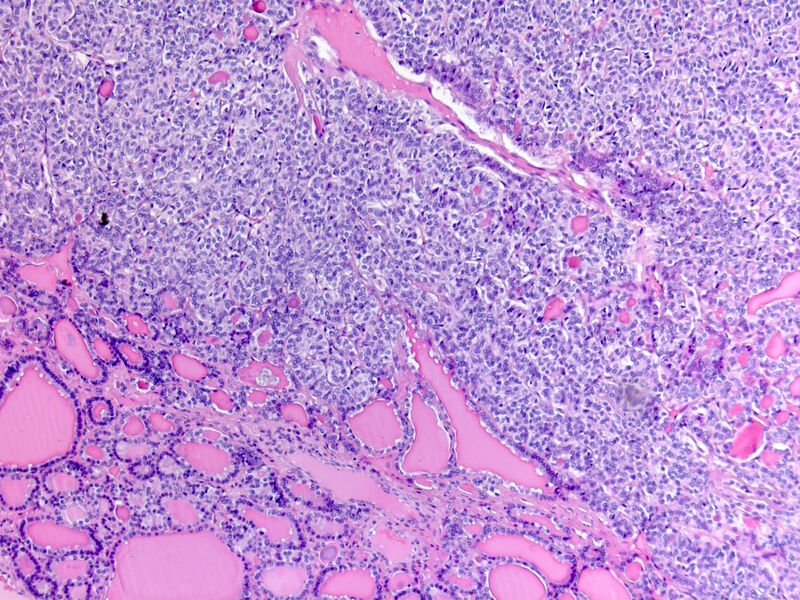 Papillary carcinoma is the most frequent (70%) thyroid carcinoma subtype. 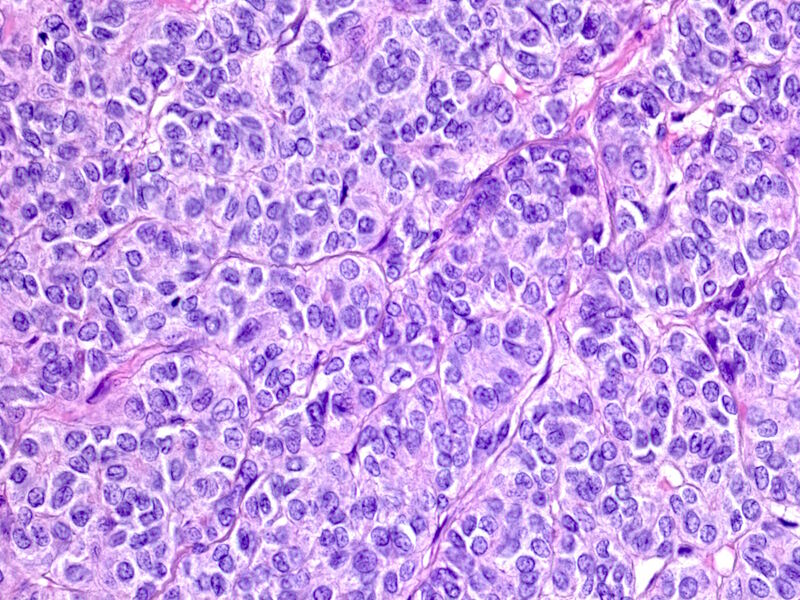 Two thirds are classical type and one third are follicular variant of papillary carcinoma (J Radiol Case Rep 2013;7:24). 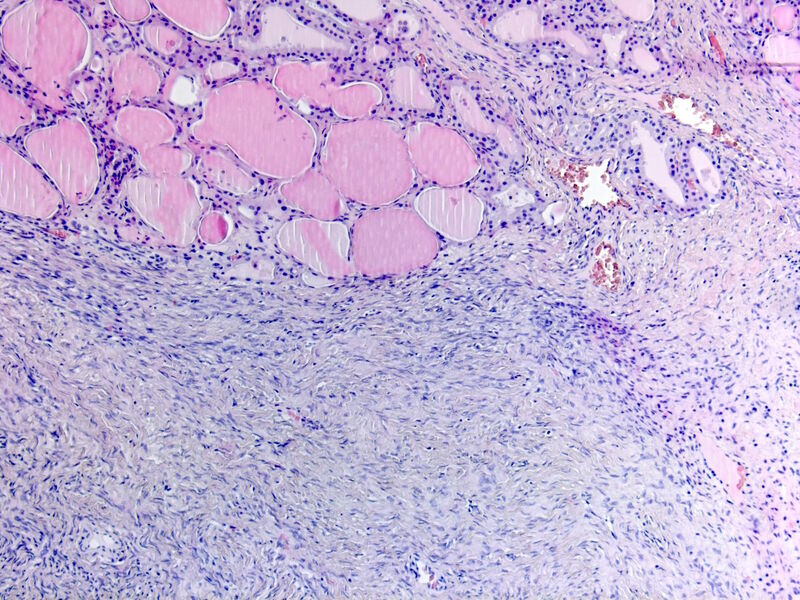 Follicular thyroid carcinoma may also develop in struma ovarii. Elevated serum thyroglobulin occurs in malignant struma ovarii, but does not correlate with clinically malignant behavior. Most cases of thyroid carcinoma arising in struma ovarii are clinically indolent. Surgery is the treatment of choice (Gynecol Obstet Fertil 2007;35:49). Total thyroidectomy is advocated to allow effective ablative therapy with radioactive iodine, to facilitate follow up and to exclude primary thyroid carcinoma (Clin Med Oncol 2008;2:147). Follow up with serum thyroglobulin levels and Iodine-131 scanning is helpful using the algorithms for thyroid carcinoma (Gynecol Oncol Rep 2016;17:56). The metastatic rate is 5 - 6%; metastases may occur up to 26 years after the primary disease (J Clin Imaging Sci 2011;1:44). The prognosis is favorable, with only a few lethal cases documented (Int J Gynecol Pathol 2008;27:496). Criteria used for malignant changes within struma ovary are the same as those used for a diagnosis of malignancy in the thyroid gland. 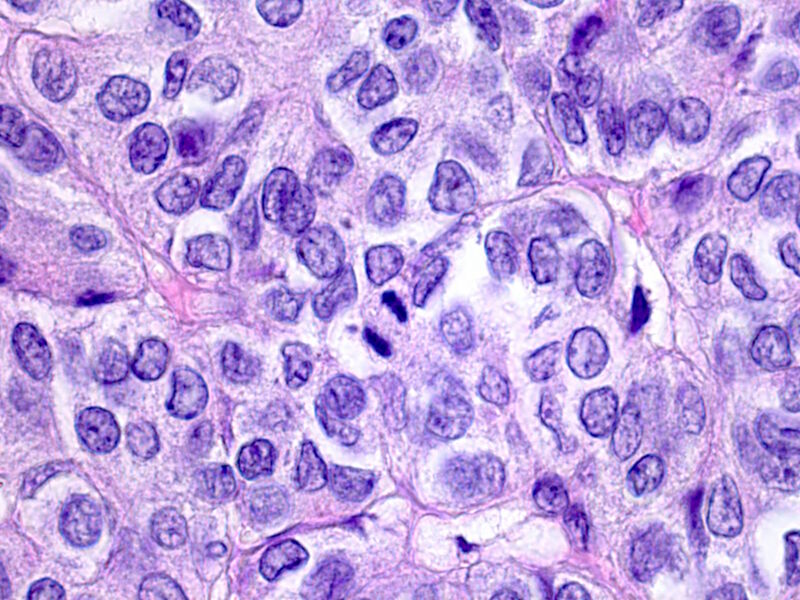 Papillary carcinoma displays characteristic ground glass nuclei, nuclear grooves and intranuclear cytoplasmic inclusions (Int J Gynecol Pathol 1993;12:333). Thyroglobulin and TTF1 immunostaining may be helpful to prove the presence of thyroid tissue (Acta Cytol 2008;52:72). 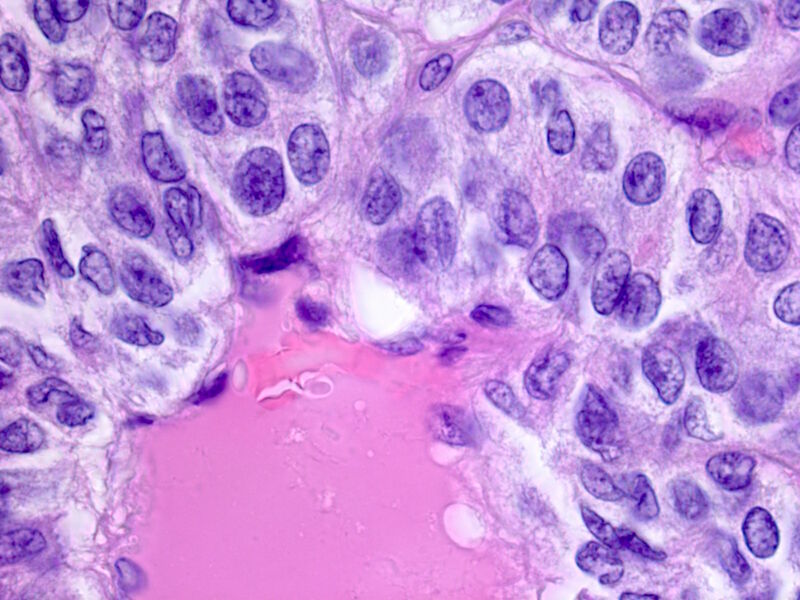 PAX8 is not useful because it is expressed in both the ovarian epithelium and thyroid follicular cells (Appl Immunohistochem Mol Morphol 2011;19:293). 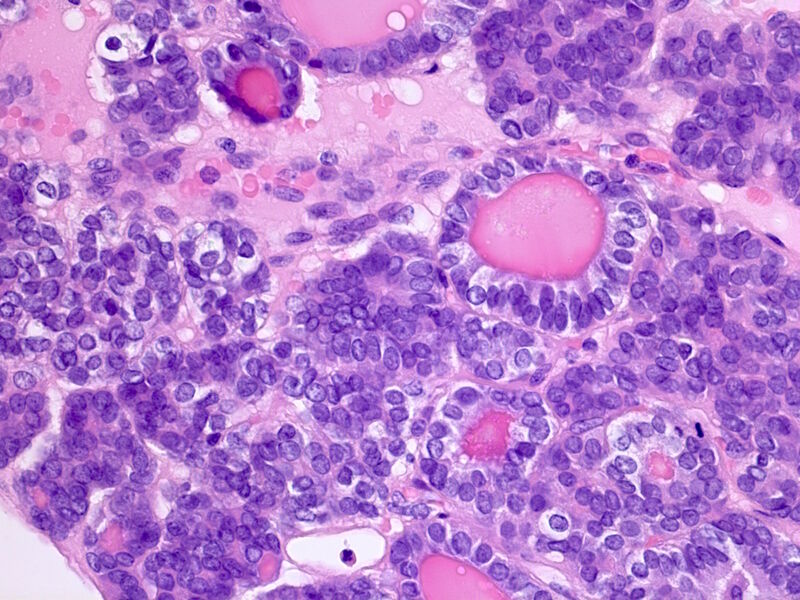 Genetic events typical for thyroid cancer (BRAF mutation, RET/PTC rearrangements) have been described in papillary thyroid carcinoma arising in struma ovarii. 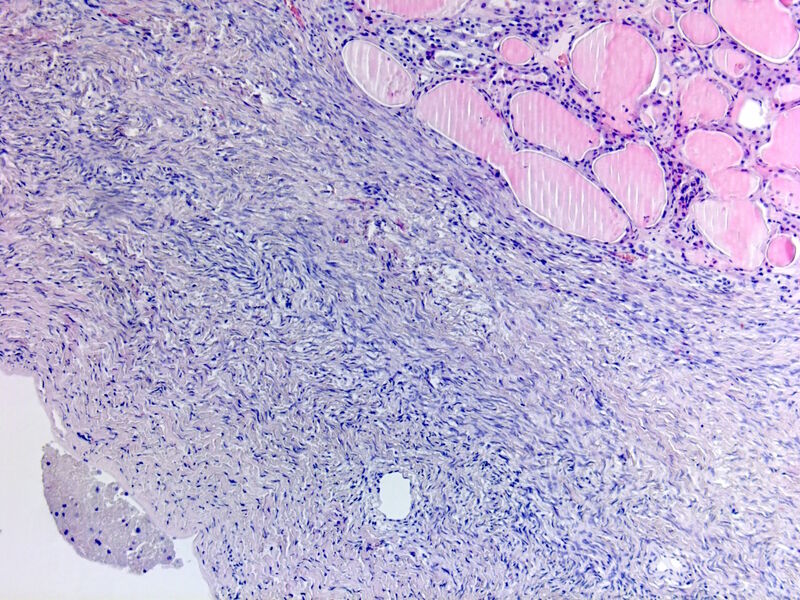 Papillary carcinoma arising in struma ovarii should be differentiated from ovarian metastases from primary thyroid carcinoma (J Radiol Case Rep 2013;7:24), which may occur many years after the primary, but cases mimicking struma ovarii are very rare (Int J Gynecol Pathol 1994;13:181). A detailed clinical history and examination are necessary to differentiate. 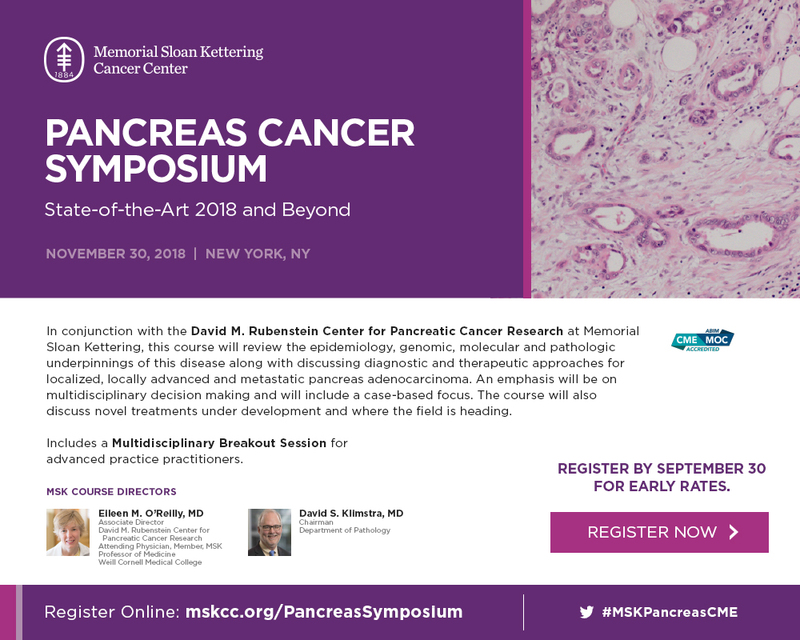 The differential diagnosis may include, in less differentiated forms, other ovarian neoplasms such as clear cell adenocarcinoma and oxyphilic tumors. Thyroid follicular cells are positive for thyroglobulin, TTF1 and PAX8. However, ovarian epithelium also shows immunopositivity for PAX8. Therefore, thyroglobulin and TTF1 antibodies are useful for the diagnosis of struma ovarii.